Step one - find refs of her scythe of course! 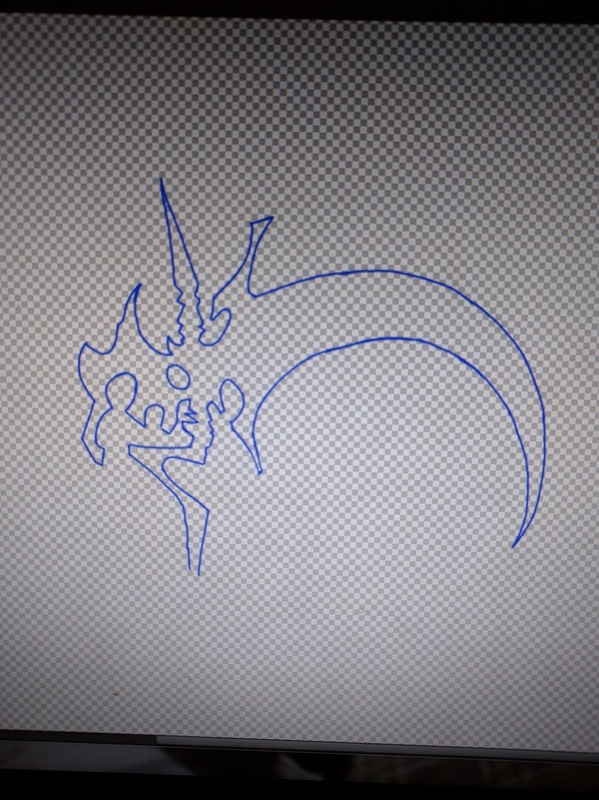 I traced off her scythe outline onto photoshop with the intention of scaling it up on a print out and copying it exactly. 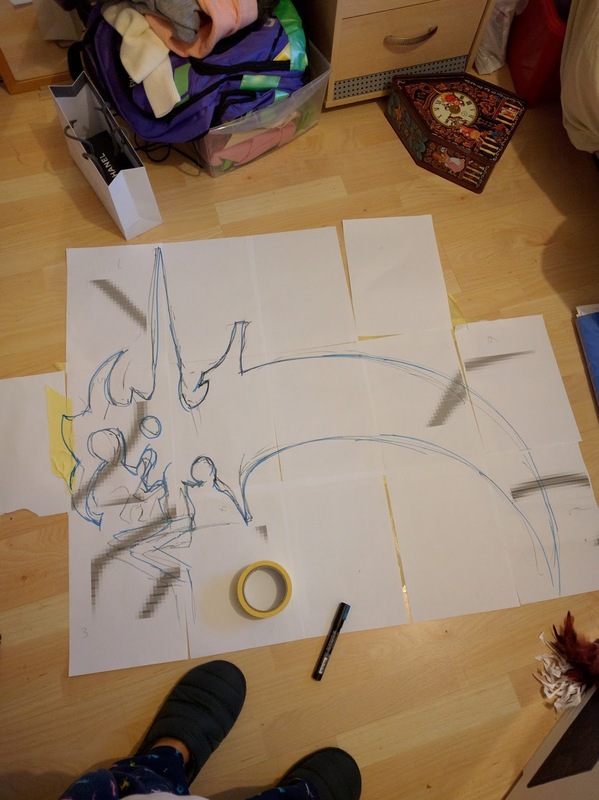 Queue 20mins of printer fighting later and I decided to free hand it with the ref to hand. I copied it best I could. 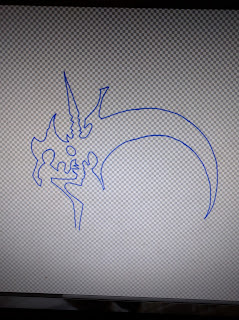 Once drawn out on paper I altered it a bit, I find the blade difficult to do since hers seems to be quite curved in some images and not in others. 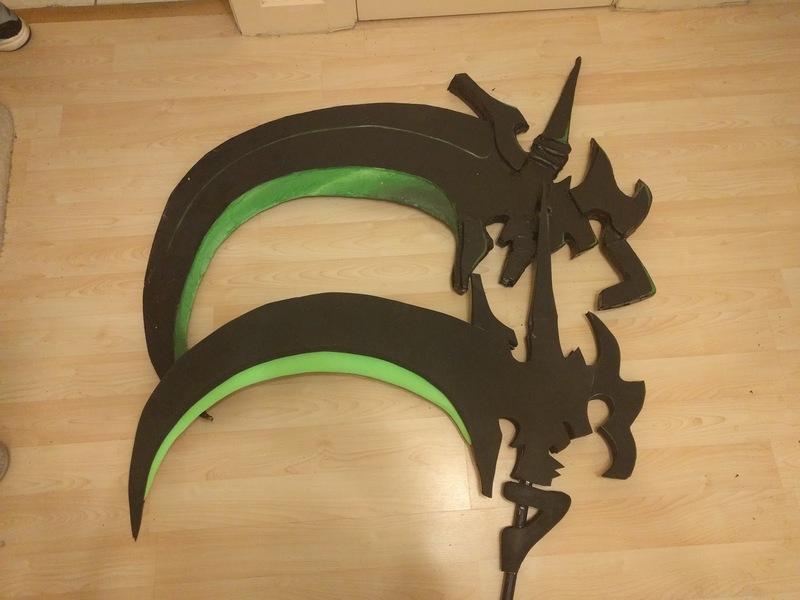 I cut the green 'blade' section off so that I could make this separately, I'll explain why later. 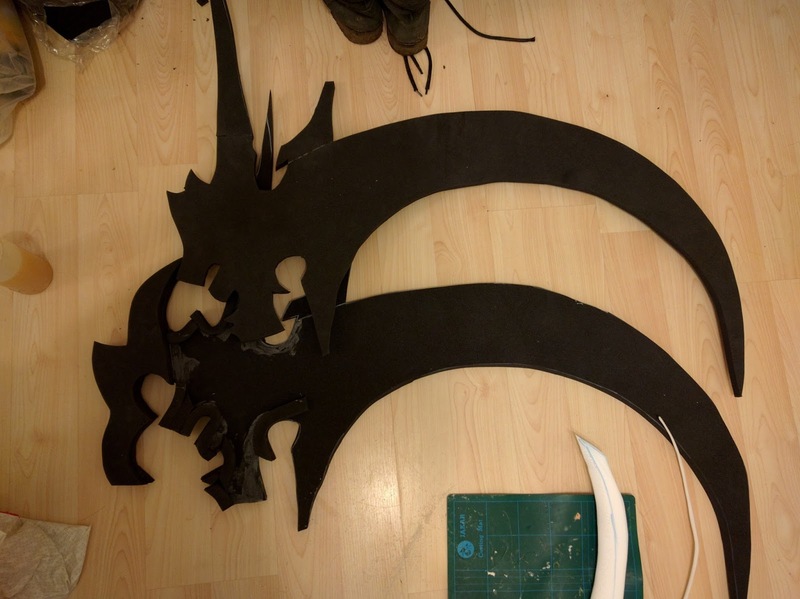 Next step is to cut it out. 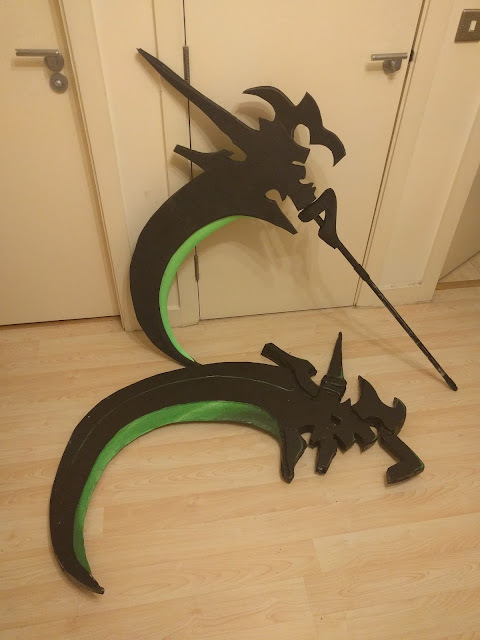 I used Plastazote for the whole thing (its a polyethylene closed-cell foam) Its very light and easy to cut but it can't be directly painted onto. Mine is made of two layers of 15mm plas. A lot of people asked me where you can buy this, it doesn't seem to be sold much non commercially but I have found it for sale on flints, I get mine from my work so I'm not sure how good the price is by comparison. It's definitely not as cheap as EVA foam but its much much easier to work with. I didn't have an entire sheet to cut from so some side bits are glued on using evo contact adhesive. 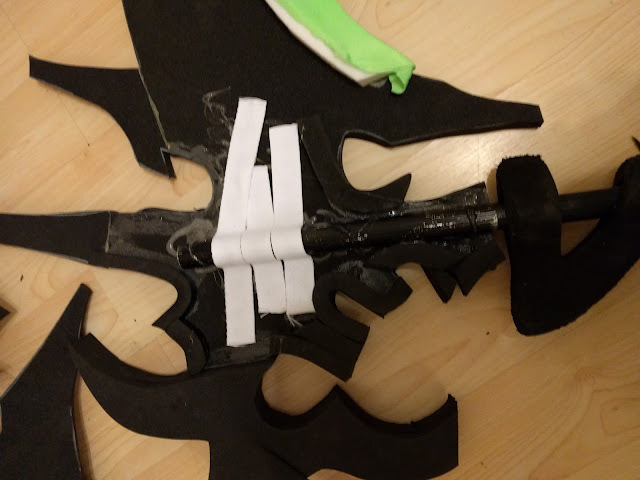 Next is prepping one side of the scythe to glue the two sides together and sandwiching the pole and blade inbetween them. 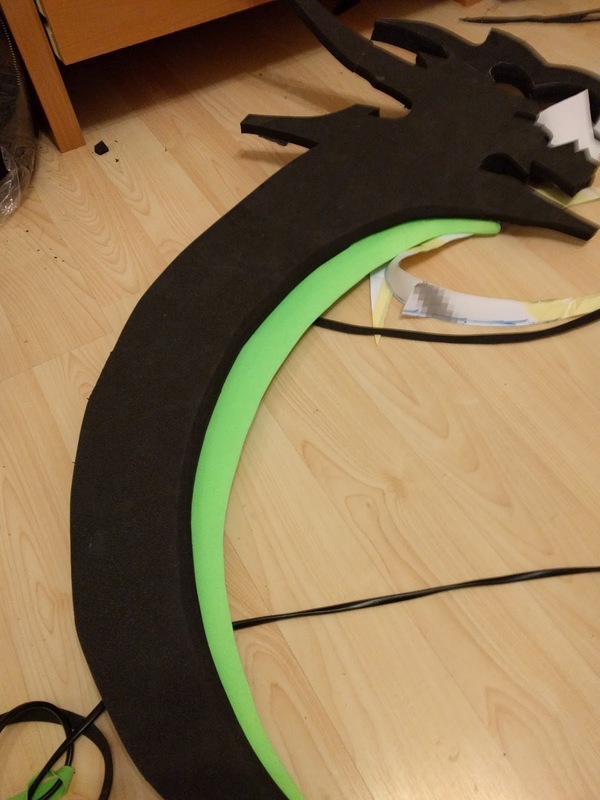 In my first scythe I had the pole be completely removable but I just found this made it a little too unstable so this time I glued it down. 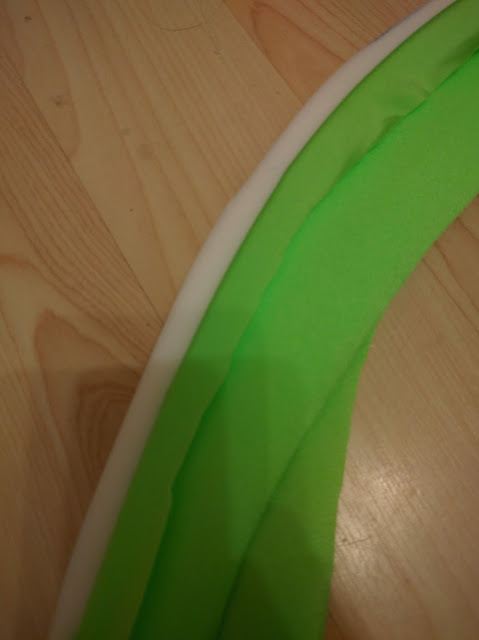 Since the pole is wider than the two cut outs I added a edge round where the pole is going to sit, this is kind of hard to explain but easier to see in the images. 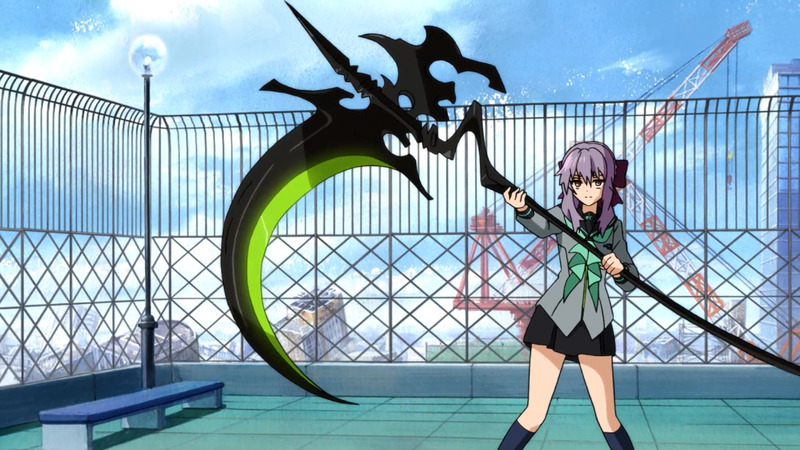 I ignored the hole thats on her scythe as it interferes with where the pole sits. I have also ignored the 'cut out' section of her scythe where it connects to the pole as again, it would be too unstable to support the weight of the plas. 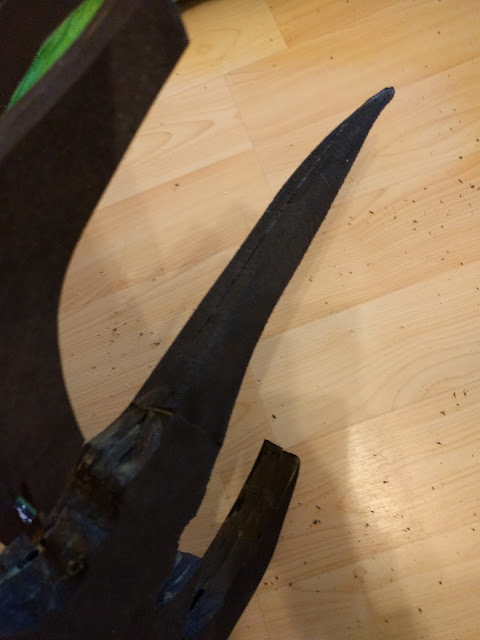 The blade - This was also done in 15mm plas, cut to size and then the edge sanded down to make the pointed edge. 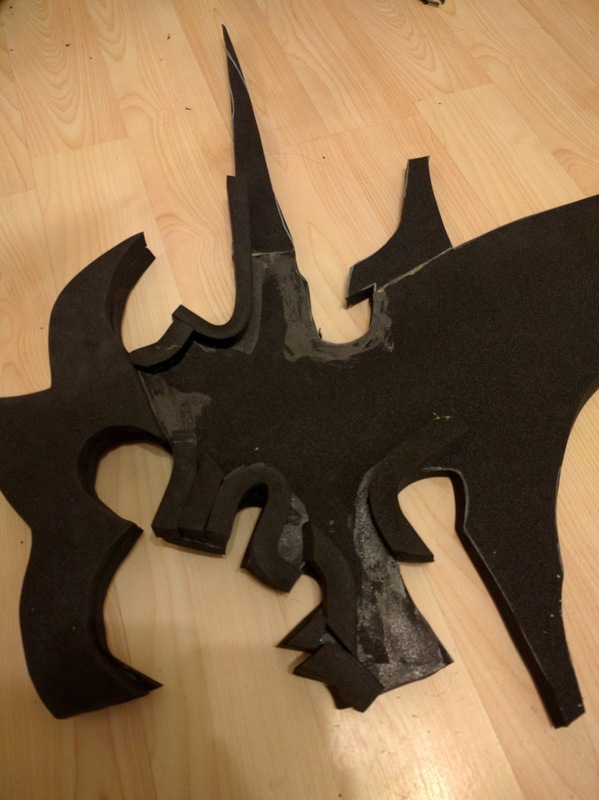 I made this bit separate so it looks like its coming out from the main piece and gives it more depth rather than cut from all one piece of plas. 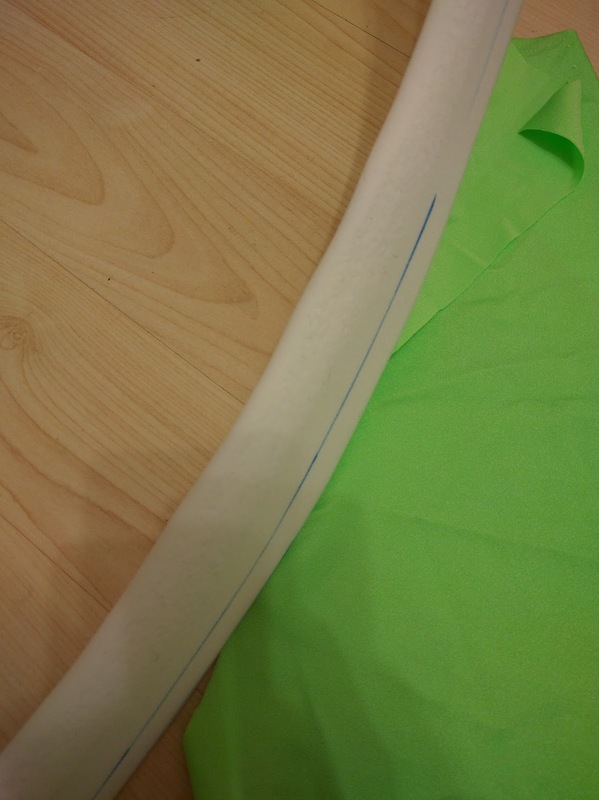 Not to mention it makes covering in lycra easier this way as there will be no visible join. Since plas can't be painted directly I chose to cover it with green lycra instead. 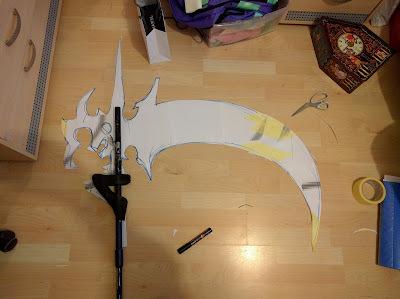 Make sure to leave an inch or so edge all the way around so it has something to adhere to the main scythe plas with. If entirely covered it will not work as well and risks coming off. 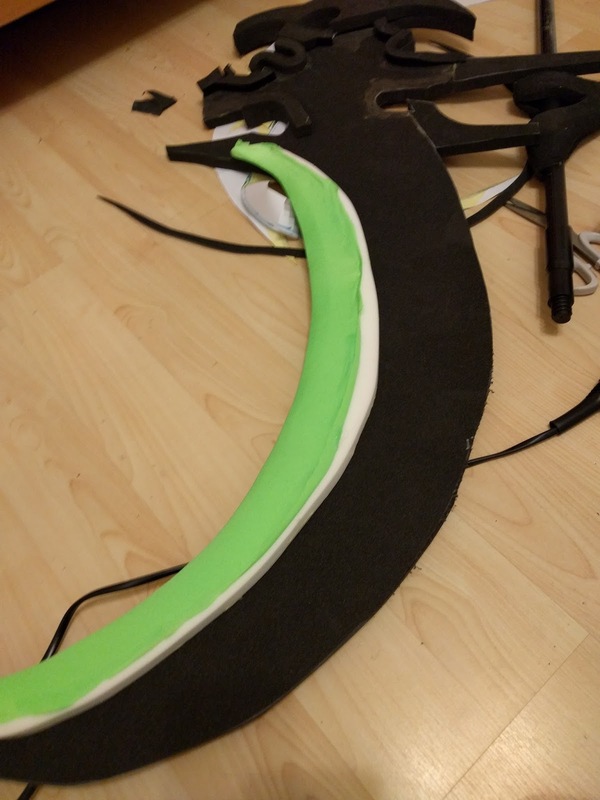 Lycra is hot glued along the edge and pulled taut to the other side. You can trim away any excess once done. Glue this down to the side already prepped with glue. Then we can move onto the pole. I found one in my broom cupboard literally...and then took the end off. Its one of those swiffer mop things, so the end screws into the flat mop end which came in handy for the bottom piece later. They're not too expensive, and the reason for this over a regular broom or mop is that the handle can be extended to be made longer and shortened to keep it compact for travel. 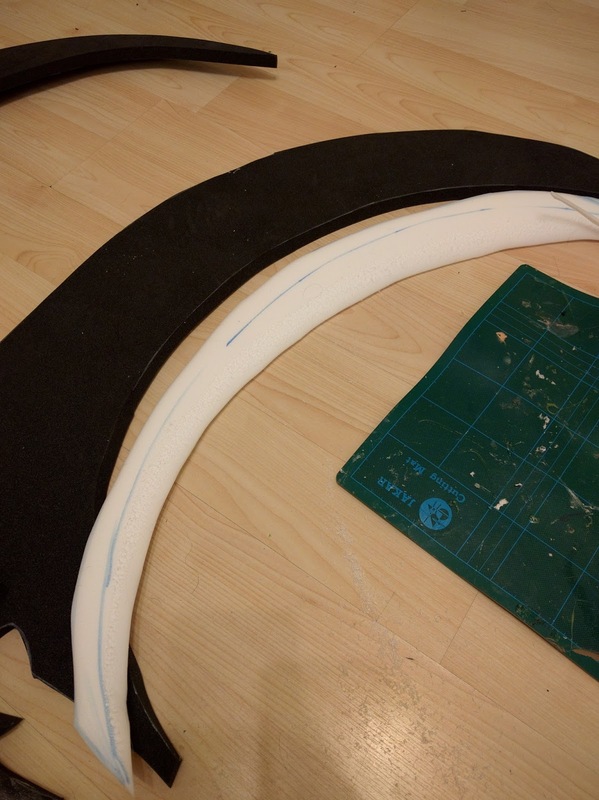 I had attempted a PVC pipe on vers #1 but this was a lot easier to manage. 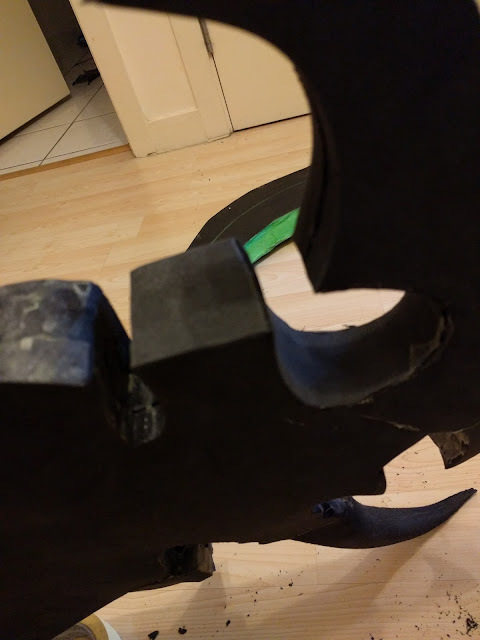 I glued this down with loaaads of hot glue and then hot glued webbing on top to really secure it. On top of that I added contact adhesive so that it will adhere to other side of plas too. It's spray painted black which does chip off when the handle is extended so its not ideal but it will do for a day out and then may need repainting. and thats it done! Above is a comparison of the two I have, You can see here how small the handle is when not extended. I chose to not do shading and keep the design simpler on this and I quite like it. 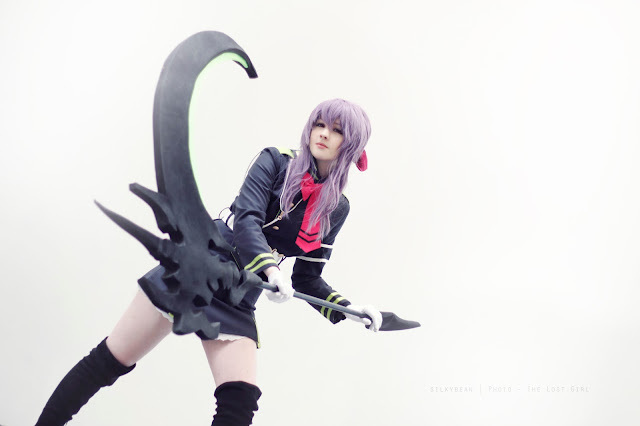 Hope this was helpful to you shinoa cosplayers, if you have a Q give me a shout!